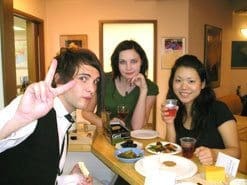 On the 29th of September 2007 Smith’s School of English in Kyobashi enjoyed a cheese and wine party! The posters had been up on the wall in every classroom, and we made sure to invite all our students, some of them multiple times! We had been discussing our favourite cheeses and crackers for weeks, and asked the keenest students which cheese they would like to see at the party. 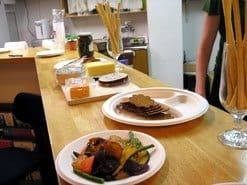 The students were looking forward to practicing English conversation with foreigners and other students, and eating a lot of free cheese and drink delicious wine at the same time! The teachers were glad to have an opportunity to be talking to students at the school in a less formal setting than the classroom. And to eat cheese of course! Our school is smaller than most English schools, so it has a family environment. This makes Smith’s School of English unique in that our monthly payment system helps to provide a friendly and relaxing atmosphere, we see our school owner often, and we can have events like the cheese party with our students! Sometimes bigger events are organized with some of the franchise schools. 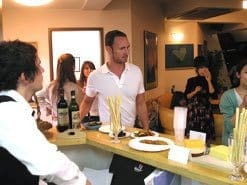 The day before the cheese party, all the wine and cheese was bought from import stores in Umeda. The selections and locations of cheese had been investigated earlier, and many types of cheeses were bought, including different kinds of Brie, Camembert, Cheddar, and blue cheese. We made sure there was a big variety to give all the students something they liked, and maybe something new that they hadn’t tried before. On the night of the cheese party we set up the wonderful cheeses on almost all of the surfaces in the lobby. We chilled the drinks and prepared the accompanying snacks. Some of the students had made sure to book lessons just before the party started. 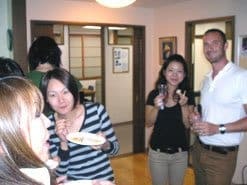 It’s convenient to have a party at an English school! Just before 6pm other students started coming in, and a couple of the teachers were ready to pour the drinks! 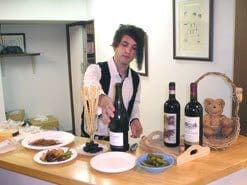 We offered several kinds of good red and white wine from Spain, France, Chile and Australia, as well as sweeter fruitier wine and non-alcoholic versions. Straight away a lot of the staff and students found that they had something in common － they loved the fruity wine. This was exciting because it started conversations between students who had never spoken to one another before. After we unwrapped the cheeses, we realized that almost all of them were different shapes of yellow. It was difficult to tell apart the different kinds of cheese. Then we had an idea. It would be fun to know some information about each cheese. So, a couple of the teachers made little labels for each cheese, writing down the origin and type. We had cheese from France, Holland, Australia, Switzerland, the U.K. and America. Not only was it interesting to know what cheese we were eating, it was also useful to know which cheeses we hadn’t tried yet! Now we could all could see that there were different cheeses in different places. Trying different cheeses was a good reason to move around the room. This made it very easy to talk to a lot of different people, too! One of the students took on the role of cutting cheese for everyone at his table. Watching him start conversations with shy students was great. For shy students, joining a group of students, talking loudly in English, was much less scary when invited to join in with “Would you like some Cheddar?” and being able to say “yes, please!” to receive a slice of Cheddar on a cracker. Not only did we compare cheeses, but comparing the different wines was also fun. Many had never had the opportunity to try a variety of good wines, and so enjoyed talking about the different grapes, origins and flavours. A few of the very excited students even learnt some of the special wine vocabulary as they went to talk about wine with the teachers. The blue cheese was interesting. One of the students tried it for the first time and loved it. Quite a few people, both staff and students thought it smelt too bad to eat! One of the teachers said that he was happy to be able to eat blue cheese, because he doesn’t often get a chance to. We tried to make the blue cheese more tempting by serving it with sweet gingerthins. This is a very delicious combination, and a few extra people were brave enough to try it. Either way, new foods are a sure way to get you talking! As predicted, the most popular cheeses were the soft ones － Brie and Camembert. They disappeared very quickly! A little more surprising was the popularity of the Philadelphia cream cheese with sweet chili sauce poured over it. Perhaps its popularity was due to the long breadsticks used to scoop it up with. One of the students brought homemade Shumai (Chinese dumpling) to share with everyone. They were also very popular and triggered an interesting conversation about different cooking styles. 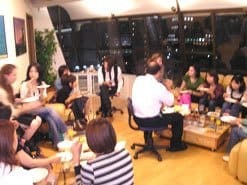 ​For all the five teachers from Kyobashi to be together in a big room with the students was great. In such a casual atmosphere it helped both students and teachers get to know one another better, and also the students get to know one another. Most importantly, I think, it gave the students a really good chance to relax with their teachers, and become more confident in their English in a friendly atmosphere. By the end of the cheese and wine party the overall skill of English speaking and listening was noticeably smoother… English conversation improves when you’re enjoying studying it!